You may well know the name Lynne Rossetto Kasper. If you listen to NPR, her voice must surely have come through your speakers. Her radio program, The Splendid Table, was a weekend joy — the program continues but after 20 years as a gracious host, Lynne stepped aside just last year. That phrase, The Splendid Table, is the title of her most famous cookbook. She has written over half a dozen cookbooks, but this one is the hallmark. A most substantial one. 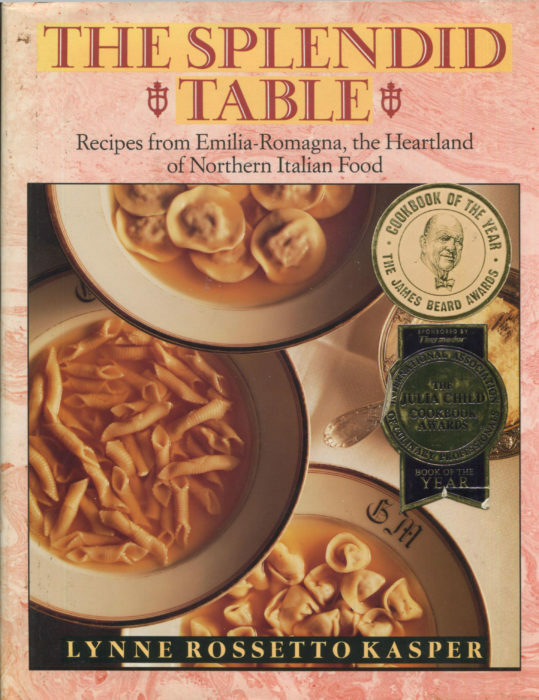 Written in 1992, the book is subtitled: Recipes from Emilia-Romagna, the Heartland of Northern Italian Food. That title, with its careful note that this is Northern Italy, is perfectly descriptive. Many of us consider the 500 pages here to be the Bible of Northern Italian cuisine. Oh, dear, I may just have insulted several Italian authors. But, I’m going to make a little modification: this is the best book available in English for someone seeking the ultimate description of Northern Italian cuisine. I think we can all agree with that! Lynne’s book begins with a most wise discussion that introduces Emilia-Romagna. Many people do not recognize that name. But say the words “Parmesan” or “Prosciutto” and you will nod with familiarity. Those are just two of the foods — technically Parmigiano-Reggiano and Prosciutto di Parma — that define Emilia-Romagna as that culinary heartland for all of Italy. The combination of climate, terroir and the tides of history have made E-R just this central area where literally “everything came together.” The region is not homogeneous with great variety running west-to-east and even north-to-south. That variation began when Etruscans, Greeks, Romans, and Gauls all extended their influence for centuries at a time. Ah, Lynne does note at the start of the chapter that ragus here are meat-intense. I think these recipe ideas may have convinced you of that. More importantly, the next time you want a sauce for pappardelle, well, you just might want to turn to this exciting chapter. These are lovely recipes, historically interesting, and offering you a flavor twist to savor. Turn to any page in The Splendid Table and you’ll immediately understand why “splendid” applies. On any page. On every page. The Splendid Table is now 36 years old. Middle age in full stride.